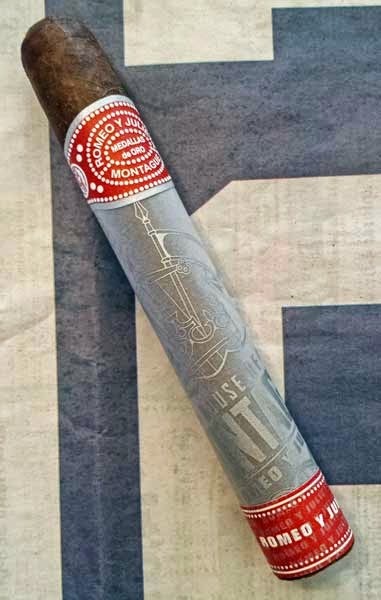 If my memory is working correctly, the Romeo y Julieta House of Montague Toro is the first RyJ maduro that I've reviewed and I thought it was a great cigar. This Famous Smoke Shop exclusive starts out with fantastic construction. Feeling down the body, the cigar is packed well full length, and it's covered with a toothy, oily, Brazilian Maduro wrapper. The wrapper is rolled on with seamless care, it has only fine veins and the cigar is topped off with a triple cap. Checking the cold aromas and draw, from the foot notes of fruity fermented tobacco hit your nose, while the free draw tastes liked spiced, fermented tree fruit. 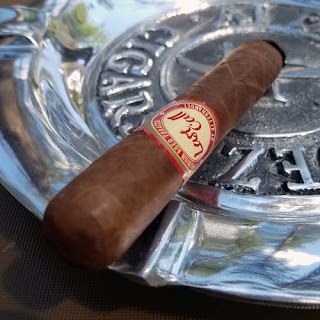 The first draws from the burning cigar are mild bodied with mixed flavors of cocoa and toast. A very tasty opening statement in my opinion. As the sharp burn line moves up the body there are added nuances of coffee, leather, earth and charcoal. After seventy-five minutes the House of Montague Toro moves into the medium body range and finishes its great burn with my favorite "burnt mocha" flavor mix. Burnt mocha is my name for a flavor mix of cream, chocolate and charcoal. Overall I really enjoyed this cigar for its flavor mix, construction and burn time. These Romeo y Julieta House of Montague Toros can be found online at Famous-smoke.com. They are available as singles, in 5 and 10 packs or by the box of 20. A box of 20 sells for $82.99, that's just $4.15 per stick, a steal on this cigar! Press Release: AVO Cigars: A New Look. A New Era.